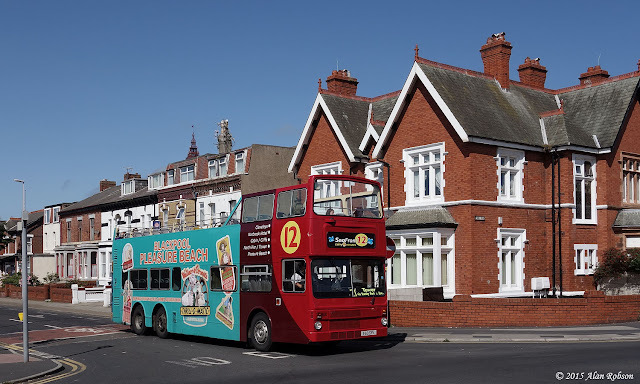 Catch22Bus Ltd's 1988 ex China Motor Bus 12m MCW Metrobus F69 SYE was in service on route 21 to Blackpool Zoo on Saturday 25th July. 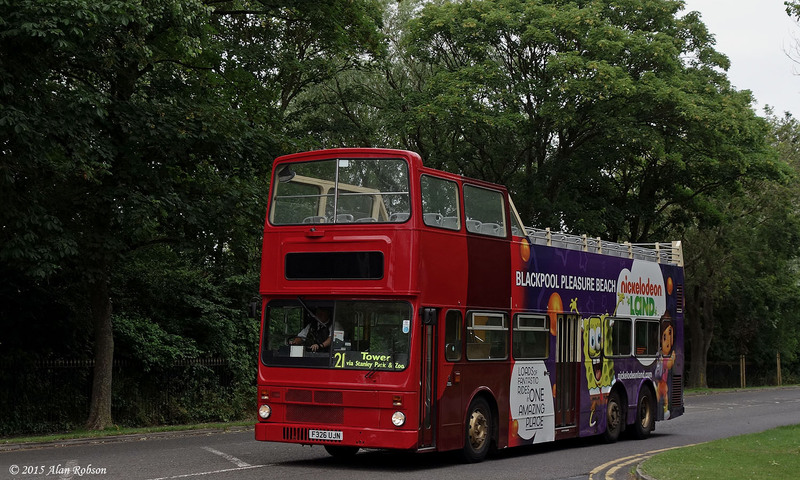 For some reason the bus was displaying a route board with the destination Tower on when en route to the Zoo, and then displaying Zoo when it was heading back towards the Tower, all rather confusing. 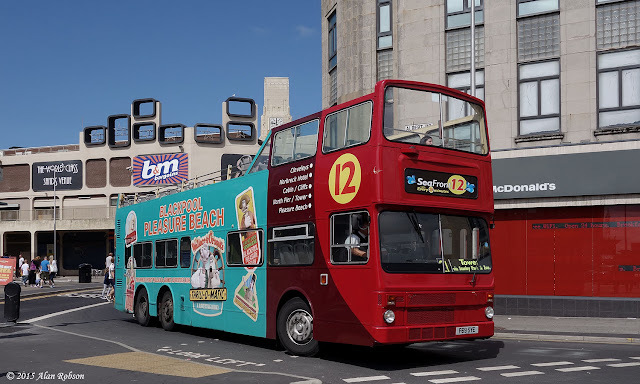 Catch22Bus Ltd's open-top former Hong Kong Metrobus F326 UJN was noted in use on their Service 21 route to Blackpool Zoo on Tuesday 21st July. 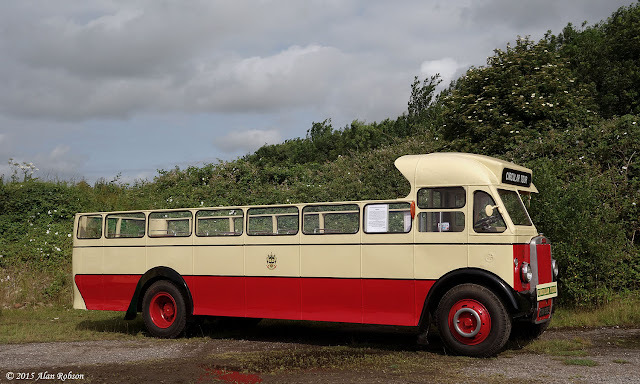 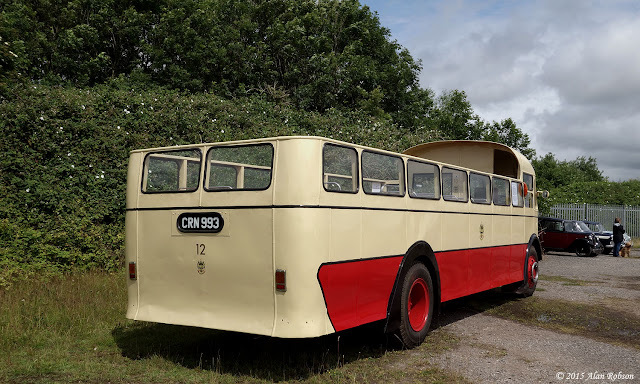 Leyland Tiger PS2/5 CRN 993, with a Blackpool built Burlingham body, was delivered new to Ribble Motor Services as their fleet number 2793 in 1950, part of a batch of twenty vehicles. 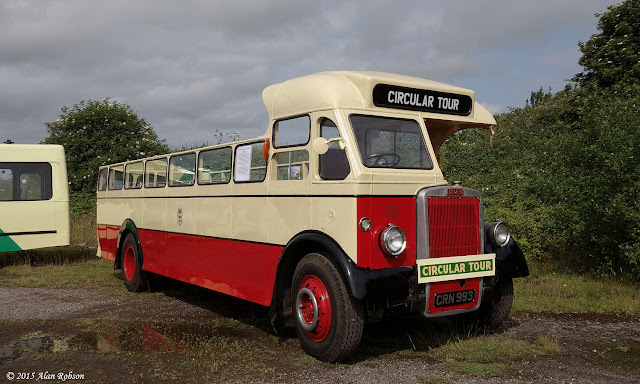 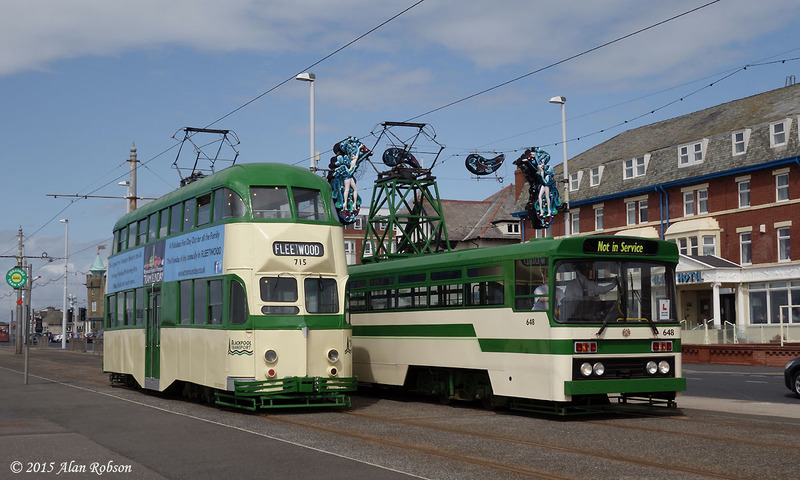 Southport Corporation Transport purchased three of the 1950 Tigers from Ribble in 1960, converting them to open-top configuration for use on circular tours around the resort. CRN 993 became No.12 in the fleet of Southport Corporation, surviving the takeover by Merseyside Passenger Transport Executive (MPTE) in 1974, before eventually being withdrawn in 1985 at the grand old age of 35. 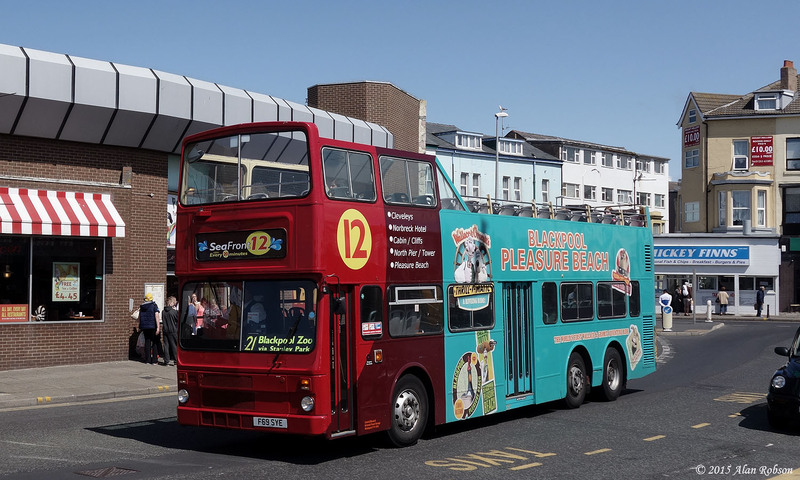 No.12 was sold to a coach operator in North Wales, before eventually ending up as a derelict hulk at the rear of the funfair in Rhyl. 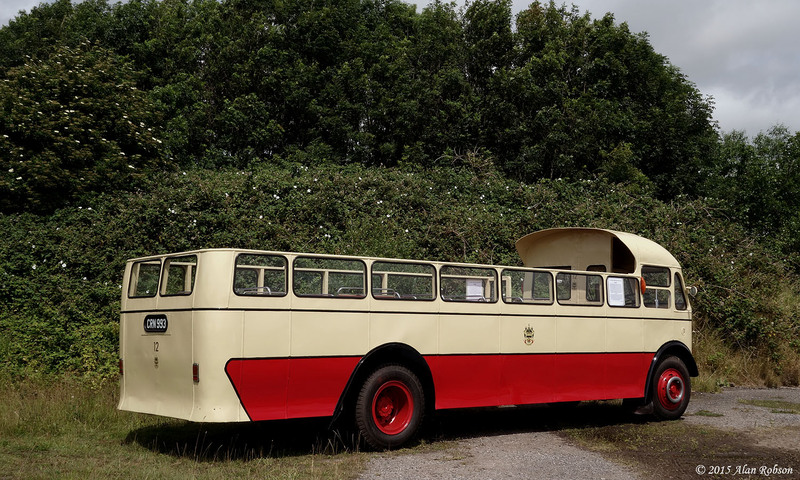 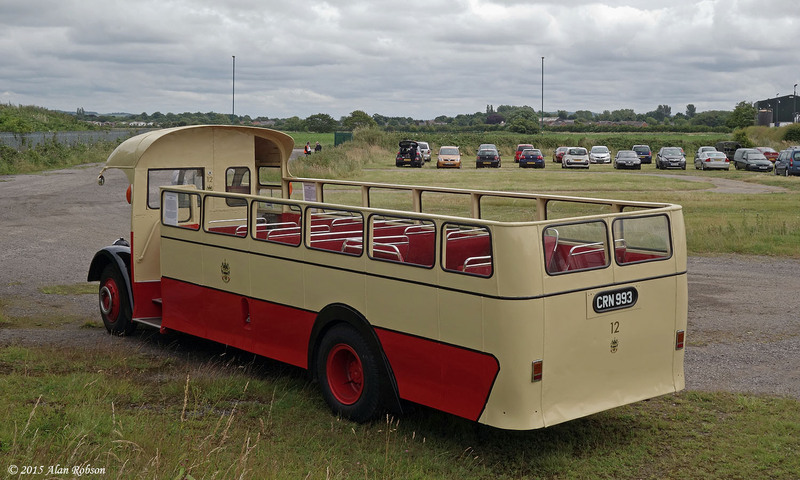 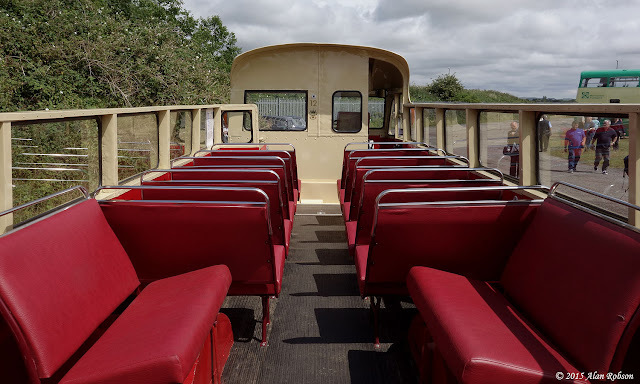 The bus was subsequently rescued for preservation, but it wasn't until the current owner purchased the vehicle that it was restored to its present condition over the last two and a half years. This set of photos were taken at the Merseyside Transport Trust's open day at Burscough near Ormskirk on Sunday 12th July. 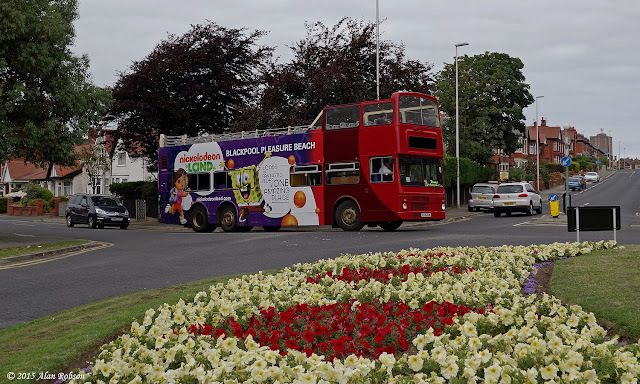 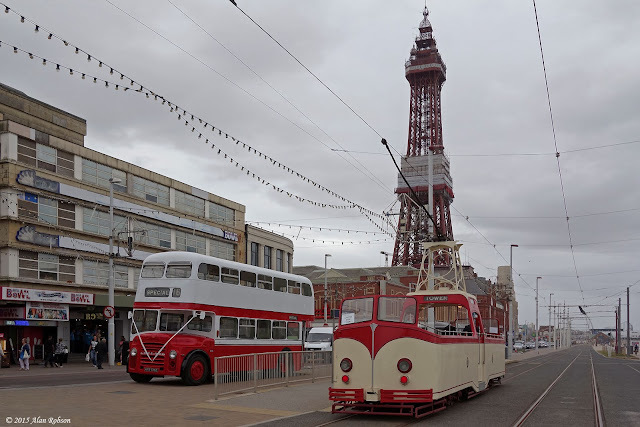 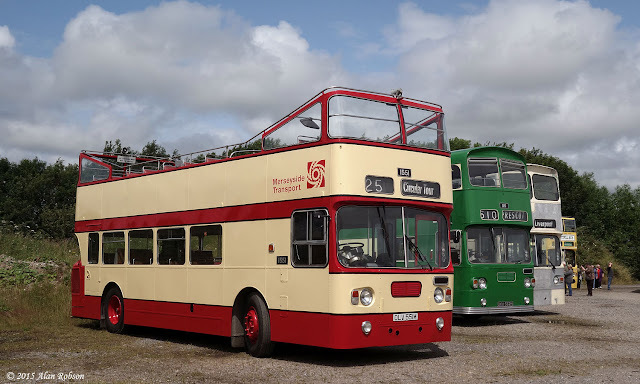 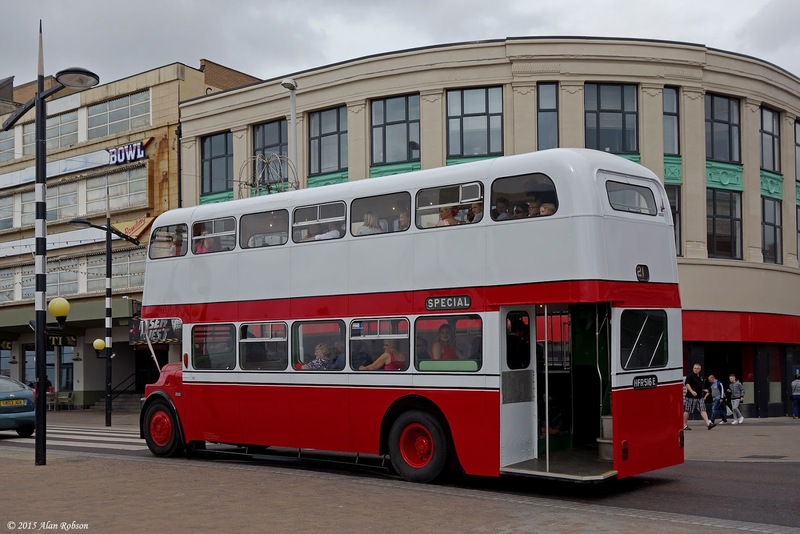 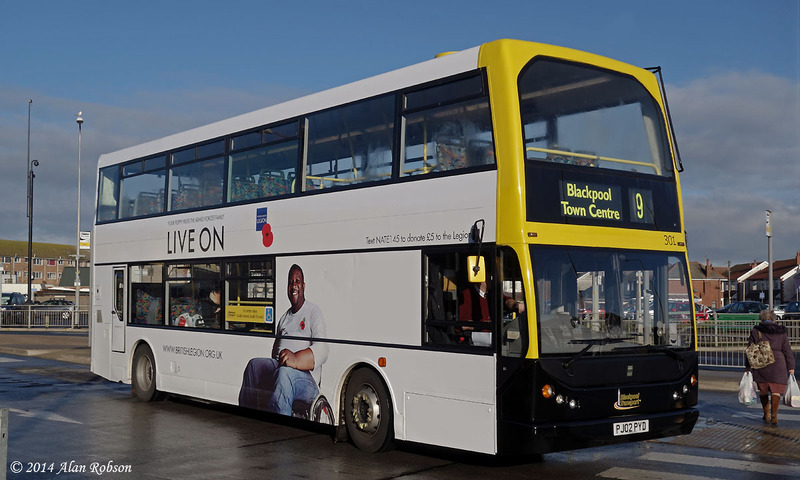 Former Blackpool Corporation Leyland Titan PD3 No 516 (HFR 516E) has been repainted into a Blackpool Routemaster style colour scheme of red and white. 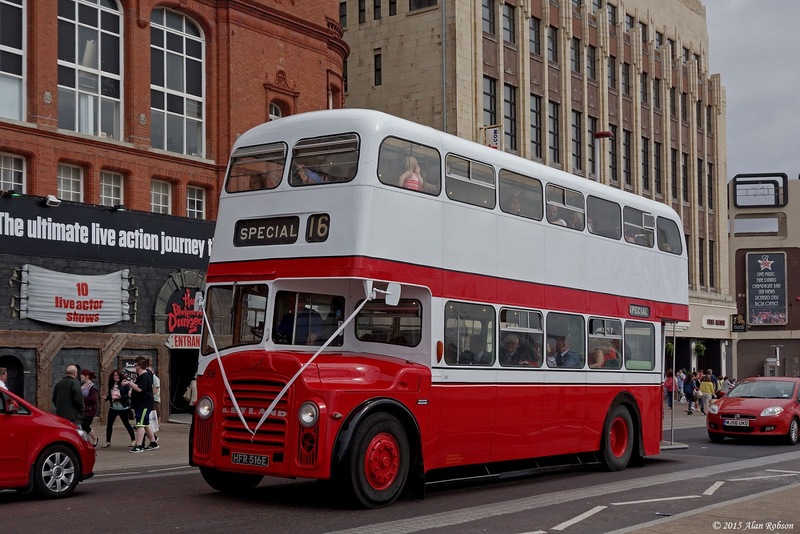 516 was noted on a private hire taking a wedding party to the chapel at Festival House on the Promenade. 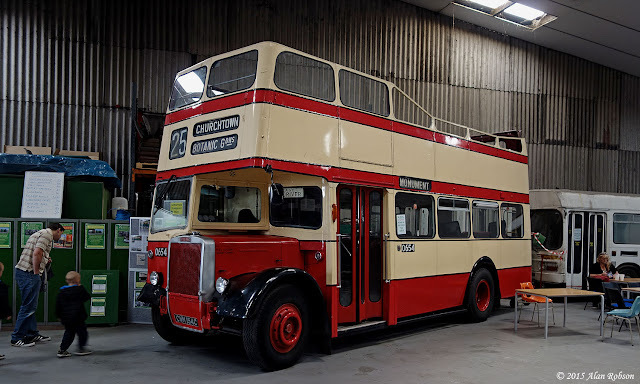 The bus is now carrying legal lettering for Catch22Bus Ltd, and looks resplendent in its new livery, although it still needs one or two final cosmetic touches before it will be complete. 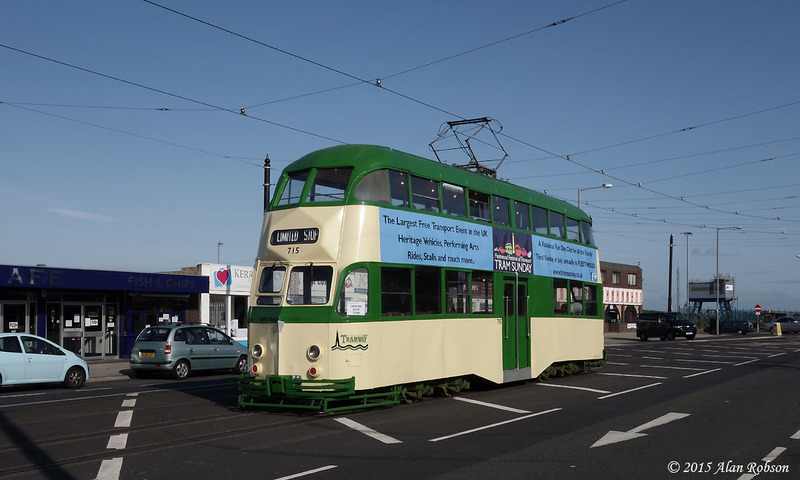 Balloon 715 was used for a private hire of the tram system during the afternoon and evening of 8th July. 715 made several trips up and down the tramway, visiting Fleetwood twice and Starr Gate once. 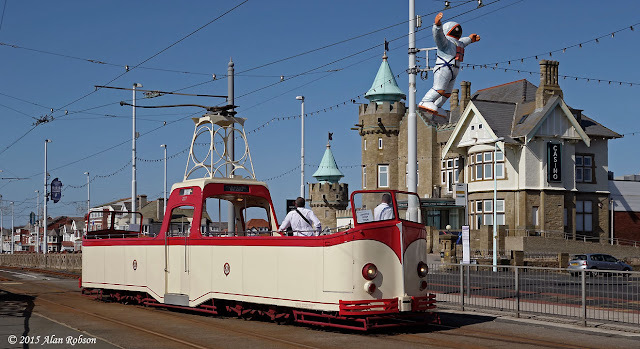 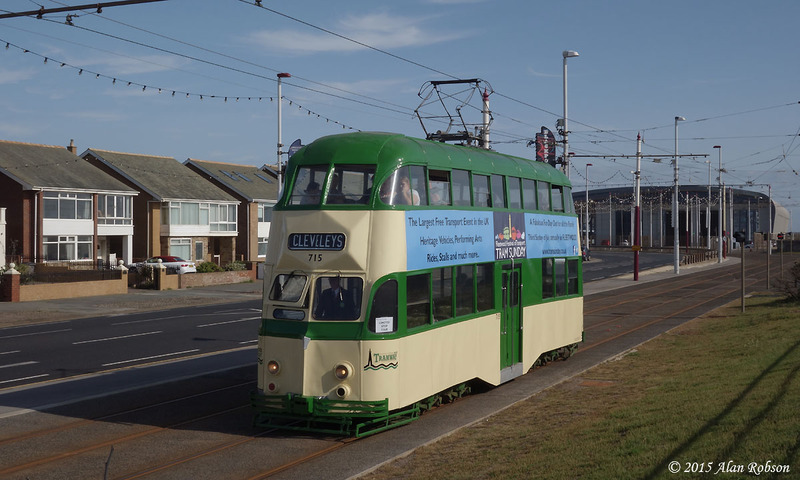 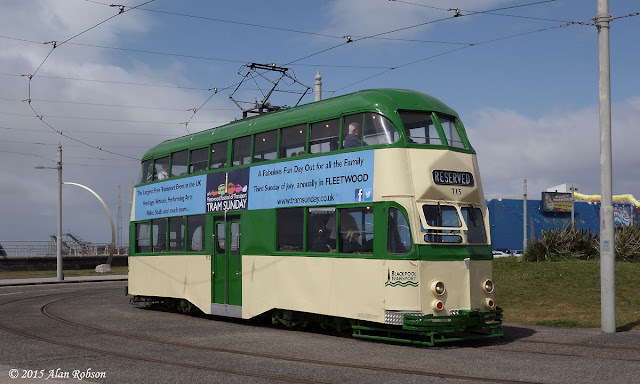 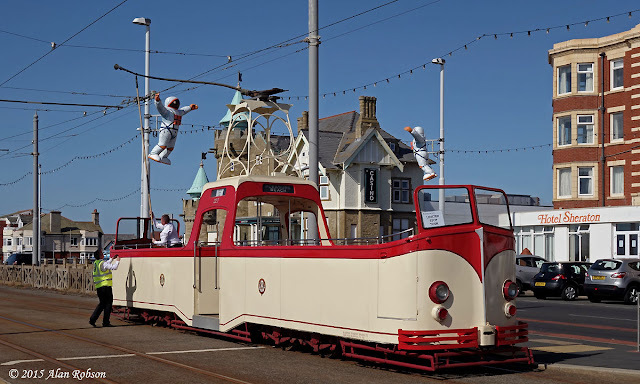 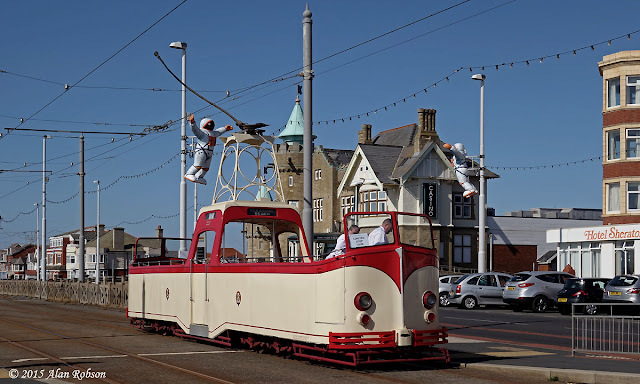 The tram was parked on the loop at the Ferry on the second visit to Fleetwood while a meal break was taken. 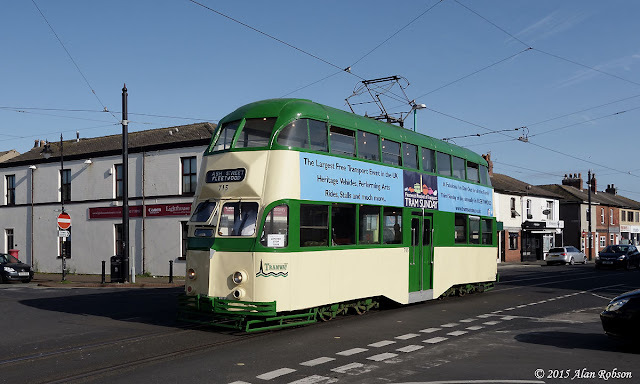 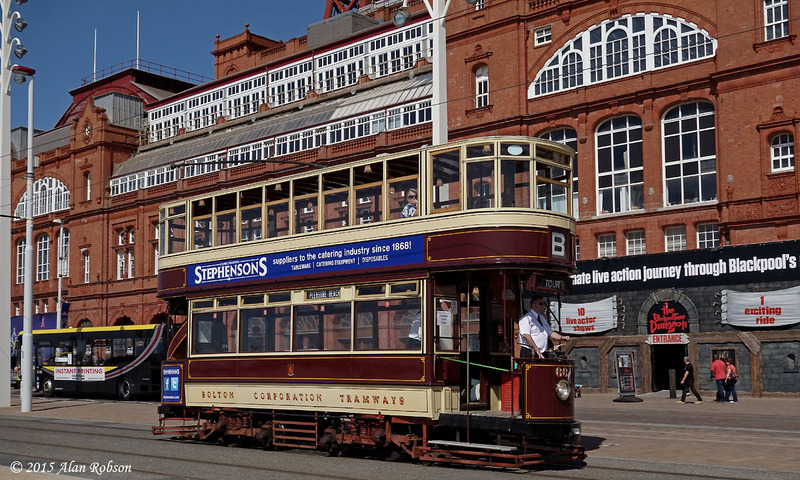 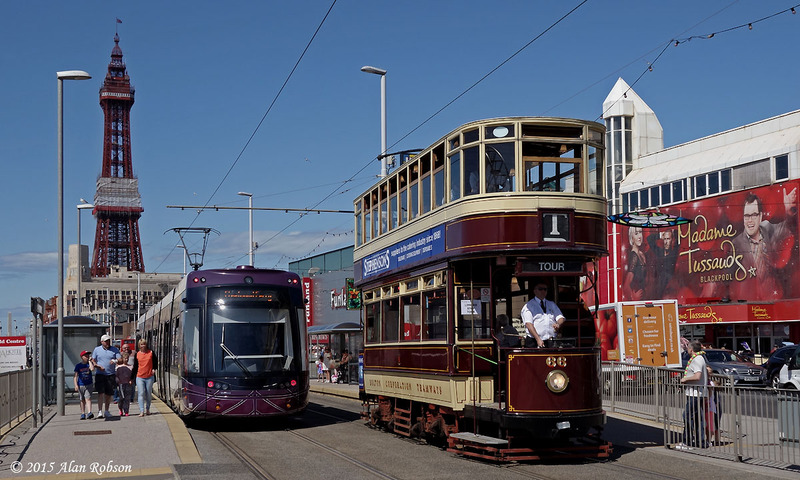 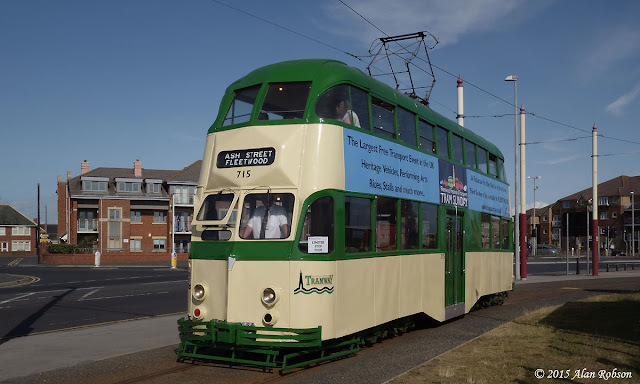 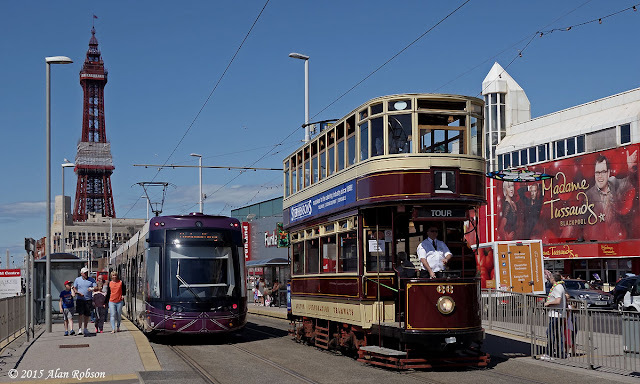 On the blue timetabled Heritage Tour service on Saturday 4th July, Boat 227 was the tram which operated the scheduled late afternoon trip from Pleasure Beach to the Cabin. 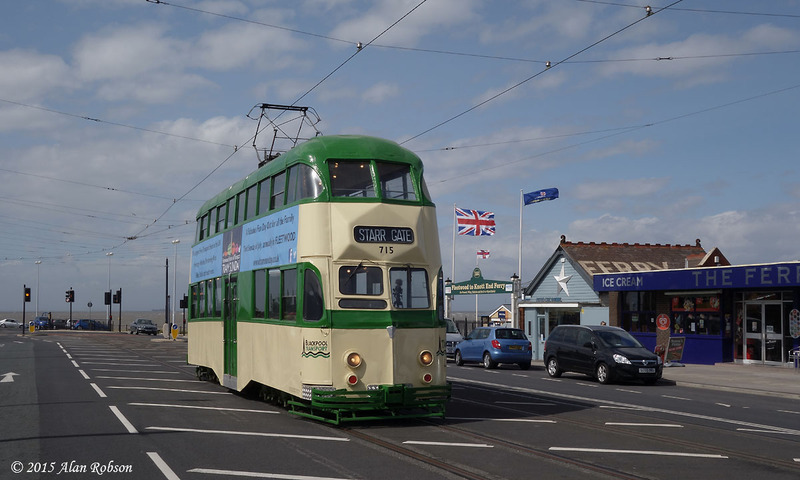 As 227 reversed and ran over the crossover at the Cabin, the trolley pole dewired on the overhead junction frog at the southbound exit of the crossing. Recovering the errant pole was a two man business due to it being so high in the air. 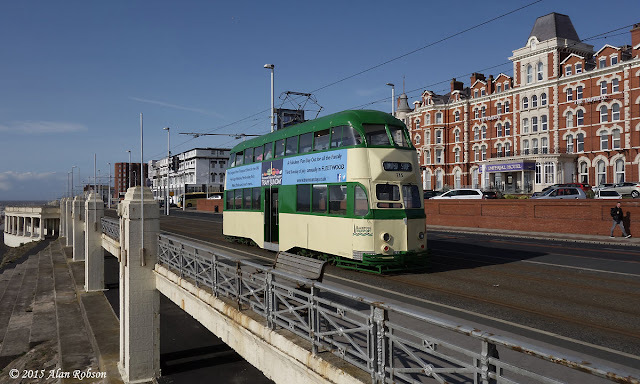 Bolton 66 has received some new adverts this week, with blue based advertising for Stephensons catering supplies being applied in the usual location between the decks. 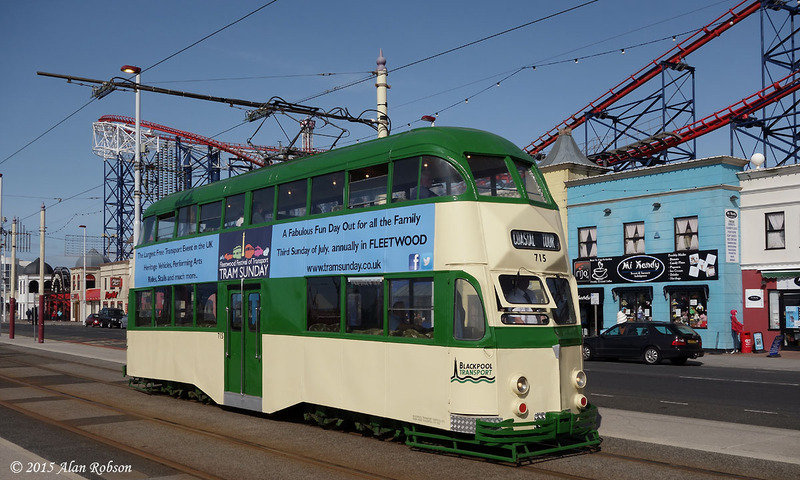 Unfortunately small square adverts with Facebook and Twitter logos on have also been positioned on the dash panels on the sides of the tram. 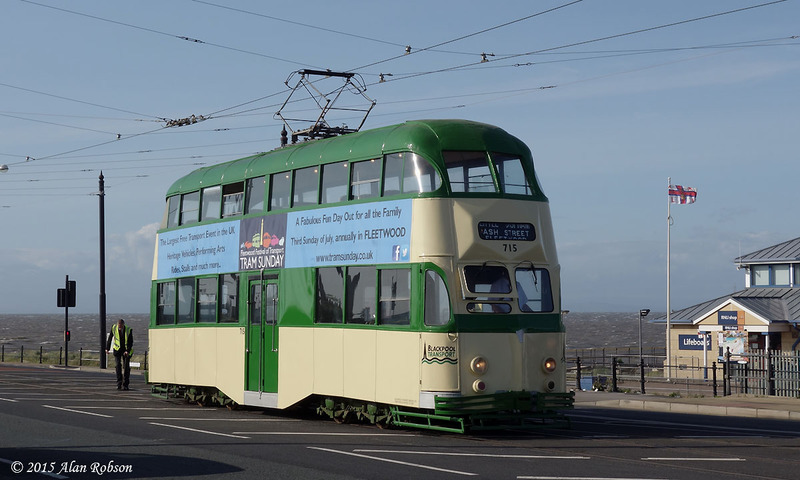 These computer age adverts looking totally out of place on a 1901 tramcar, with their internet logos inappropriately emblazoned on both ends of the tram. 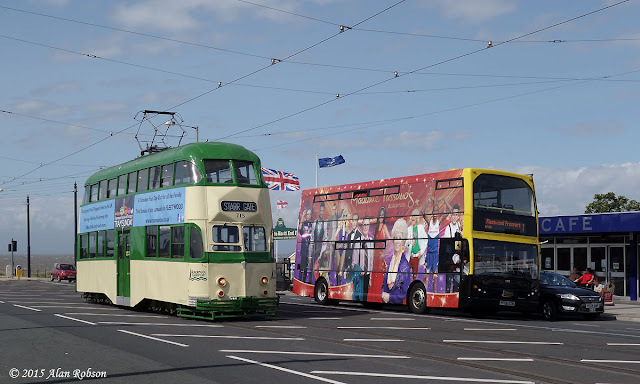 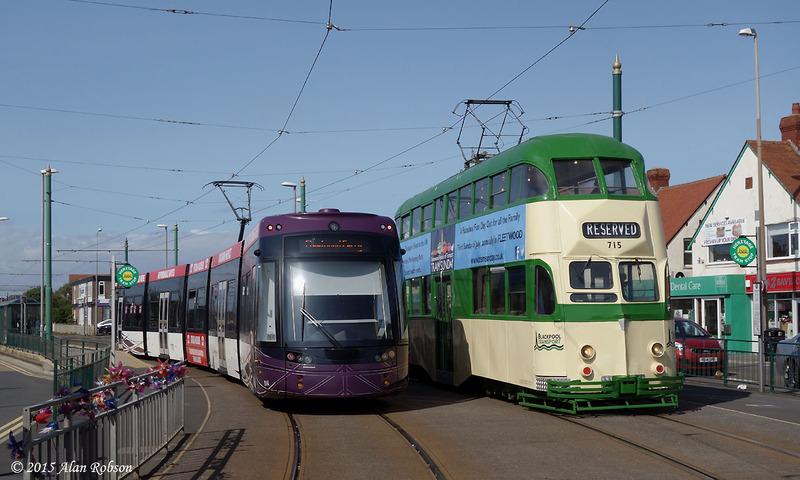 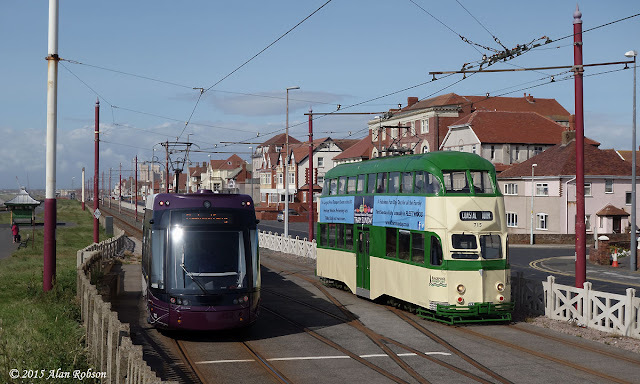 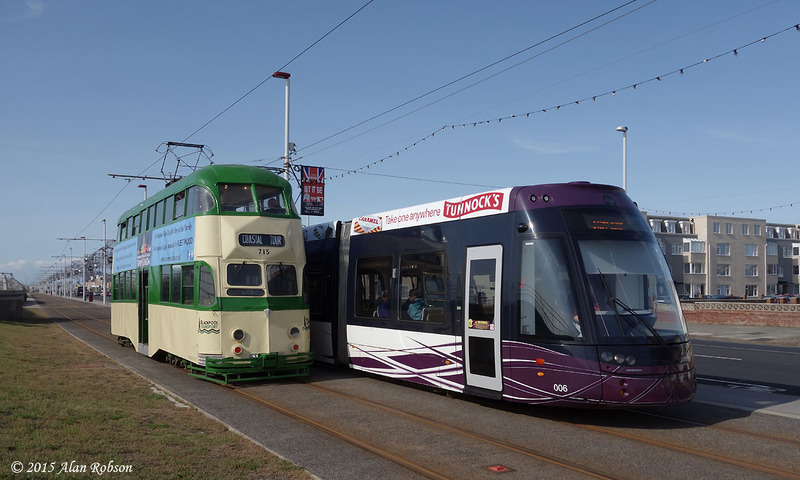 With 715 and 66 both now carrying modern style adverts, it is to be hoped that the rest of the heritage fleet don't all become covered with advertising, albeit that the extra income is no doubt useful for the upkeep and running of the trams. 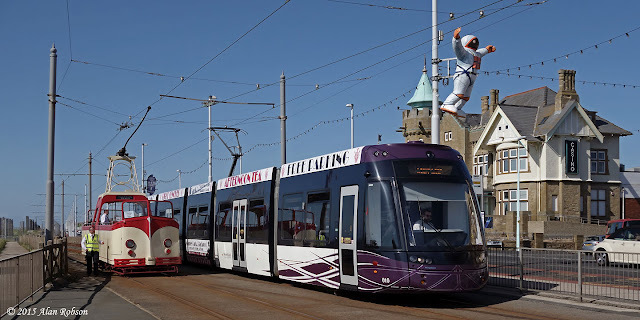 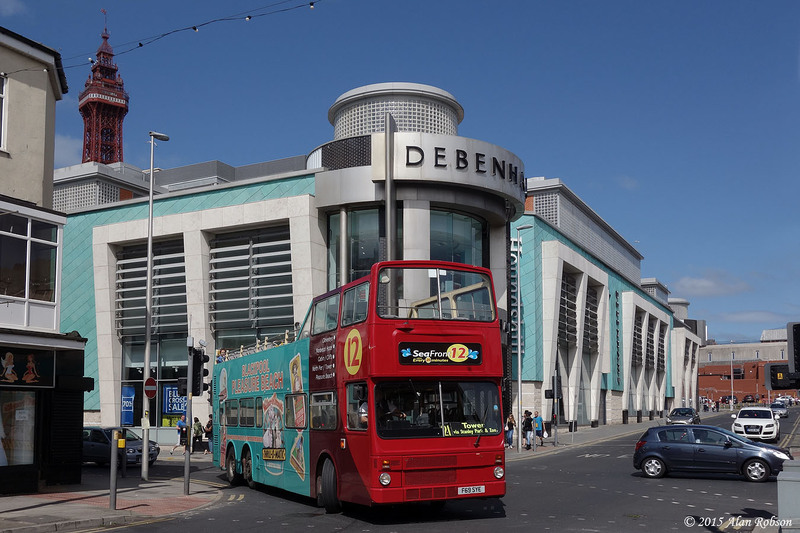 Blackpool Transport 301 has joined the list of Dennis Tridents to be outshopped with new overall adverts this year. 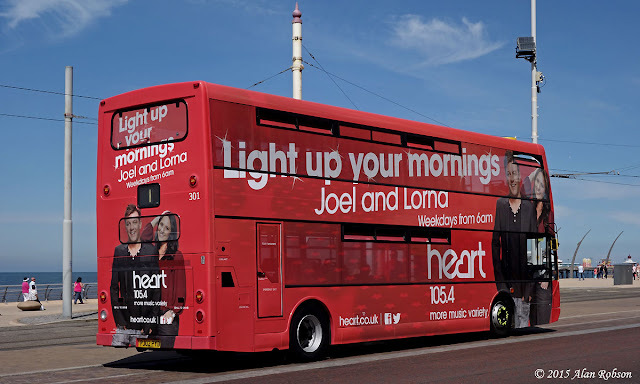 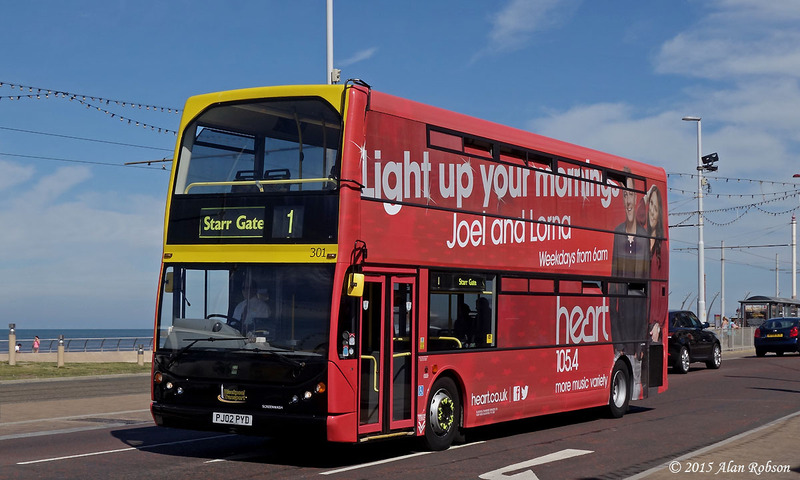 301 is carrying a new red based advert for Heart Radio, replacing the previous overall ad for the British Legion which was applied at the latter end of last year.